Muchacho spent the first years of his breeding career in Canada at Harvey Trimble’s Valiant Ranch. Itsy Bitsy Burro Company became his home in the fall of 1999. This Motown son is registered in Canada as black and stands 33 ½ inches tall. His cooperative and gentle temperament is unmatched. 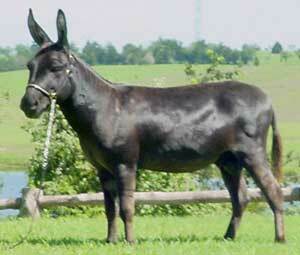 Muchacho is the sire of our multiple halter winning and Houston 2000 Model Donkey, Starlet . We are proud to have him as one of our herd sires at Itsy Bitsy Burro Company.